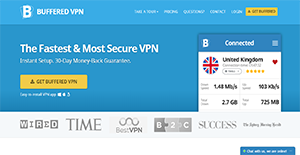 Buffered VPN is a trustworthy application that provides fast connection speeds and highly-secure connections. It is easy to install and works for Windows, Mac, and Linux machines. With Buffered VPN, users can look forward to unfettered content access. This means that they can view information and watch videos irrelevant of their current location. And while they are at it, the application also works on protecting their privacy so that they can feel safe and secure online. Moreover, Buffered VPN protects users against malicious attacks. It builds a wall to deter hackers from accessing their data and using them for their own purposes, especially on Wi-Fi hotspots. Buffered VPN provides users with high-grade encryption for their data. This means that their activities go through a secure tunnel where information is encrypted to protect personal details like bank accounts, social media passwords, online activities, and more. Plus, users can also rest assured that Buffered VPN does not save any of their information or online activities into their servers. With Buffered VPN, users can surf anywhere like locals. This means that geo-restrictions are bypassed so they can access content they would not have been able to before. This lets them enjoy any website or even computer or mobile app and say goodbye to government or workplace censorship. Buffered VPN has dedicated servers around the world. At the moment, there are servers located in 40 countries. This affords users the ability to choose whichever virtual location they want so they can enjoy premium privacy and anonymity all the time. Users are vulnerable especially when they are using a shared or public Wi-Fi network. That is why Buffered VPN works to build a shroud over a person’s computer so hackers and other malicious individuals or even institutions cannot take a look at their online activities and personal details like credit cards and electronic payment accounts. If you are considering Buffered VPN it might also be a good idea to investigate other subcategories of Best VPN Services gathered in our base of B2B software reviews. There are trendy and widely used systems in each software group. But are they necessarily the best fit for your company’s special wants? A trendy software application may have thousands of customers, but does it present what you need? For this reason, do not blindly spend on popular systems. Read at least a few Buffered VPN reviews and think about the elements that you wish to have in the software such as the price, main features, available integrations etc. Then, choose a few solutions that fit your requirements. Check out the free trials of these products, read online comments, get explanations from the vendor, and do your research meticulously. This profound groundwork is sure to aid you choose the most excellent software application for your organization’s special wants. How Much Does Buffered VPN Cost? All Buffered VPN plans include the software and entitle users to 24/7 customer support and fast-speed unlimited bandwidth. We realize that when you make a decision to buy VPN Services it’s important not only to see how experts evaluate it in their reviews, but also to find out if the real people and companies that buy it are actually satisfied with the product. That’s why we’ve created our behavior-based Customer Satisfaction Algorithm™ that gathers customer reviews, comments and Buffered VPN reviews across a wide range of social media sites. The data is then presented in an easy to digest form showing how many people had positive and negative experience with Buffered VPN. With that information at hand you should be equipped to make an informed buying decision that you won’t regret. What Support Does This Vendor Offer? What are Buffered VPN pricing details? What integrations are available for Buffered VPN? Pros: Many more established VPNs have suffered of late on the Netflix VPN crackdown. But Buffer VPN is new and has so far escaped the radar of the video streaming studios. I’ve been using it for two months now and I have yet to experience an issue with my Netflix subscription. Streaming is stable, no hiccups at all. Looking forward to a year of smooth streaming Netflix series. Cheers! Cons: The prospect of Netflix or Hulu ban is always there, not just for this VPN but for the whole industry. Pros: It has a no-log policy, which guarantees your privacy. It’s easy to install on Windows, Linux and Mac. It has unlimited bandwidth and server switches across its price points. And it provides 24/7 support. Plus, the performance is A-okay, no streaming issues at all. It’s a 4-star VPN for me. Cons: No live chat in case you need immediate support. In order to ensure high-quality of our reviews we'll have to verify your email address. Please insert your email address below. A verification email has been sent to the address you provided. Please click on the link in that email to finalize your review submission. Did you find this review useful? How can we make this page better? If you need more information about Buffered VPN or you simply have a question let us know what you need and we’ll forward your request directly to the vendor. I agree for my personal details to be sent over to the vendor for the purpose of answering my question. FinancesOnline is available for free for all business professionals interested in an efficient way to find top-notch SaaS solutions. We are able to keep our service free of charge thanks to cooperation with some of the vendors, who are willing to pay us for traffic and sales opportunities provided by our website. Please note, that FinancesOnline lists all vendors, we’re not limited only to the ones that pay us, and all software providers have an equal opportunity to get featured in our rankings and comparisons, win awards, gather user reviews, all in our effort to give you reliable advice that will enable you to make well-informed purchase decisions.